Pre-Bushwhacker, Armstrong knew that to stand any chance of winning the competition he had to make sure of victory on the loose surface meeting. In stark contrast, Duggan had to finish second to his arch rival – and that was exactly how it played out on the six stage Omagh Motor Club meeting. “I’m absolutely delighted to have won,” beamed Duggan at the finish. “It has been a very long year but the effort my sponsors and everyone in the team have put in to try and win this prize drive has been worth it. It’s good to come out on top against some very talented and extremely fast drivers. The action got underway with Armstrong setting the fastest time on the opening Carrickaholton test, five seconds ahead of the chasing Duggan. Next up was Omagh’s Alan Smyth – the third driver who could also walk away with the prize drive. However, he too needed to win, but found himself on the back foot early following a heart-stopping moment at the start of SS1 that knocked his confidence. Omagh’s Patrick O’Brien (Citroën C2R2) was having a brilliant drive in fourth while Adam Bustard continued to impress on gravel by occupying fifth in his Ford Fiesta R2, with Scottish visitor Fergus Barlow next up, also in a front-wheel-drive Ford Fiesta R2 in sixth. Dunmurry’s Kyle White displayed some early promise in his Citroën, but a buckled wheel at the start proved costly. In spite of this setback he was extremely pleased with his times. “We’ll push on in the afternoon,” said White, who missed the penultimate round of the series after failing in his efforts to source a gravel kit. Third for Patrick O’Brien was just reward for the teenager and the only high of an otherwise frustrating season for him and Tommy Nugent. Fourth CFR2Wales crew home was Adam Bustard and David Young, with Fergus Barlow and Leon Gordon bagging fifth. Kyle White and retiring team-mate Sean Topping took sixth, while Drumquin’s Ian Dickson guided his Ford Fiesta ST to seventh. 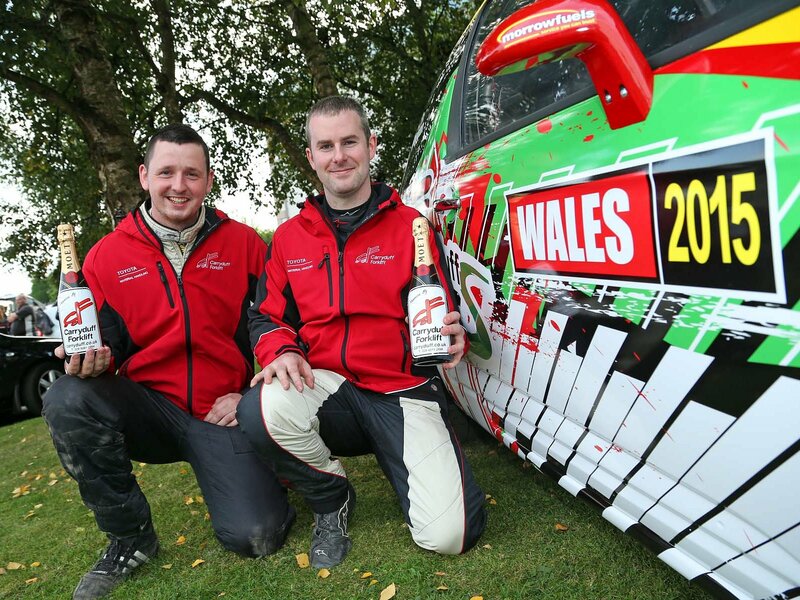 As the Carryduff Forklift Road To Wales competition has reached its successful conclusion the focus now switches to November’s Wales Rally GB – the closing round of the World Rally Championship. Duggan can now look forward to sharing the world stage with some of the sport’s biggest names and taking on WRC3’s very best drivers, including current points’ leader Quentin Gilbert (FRA). They will be joined by Norway’s Ole Christian Veiby, and rising Italian star Andrea Crugnola. In total, WRC3 crews will battle it out for supremacy over nineteen high-speed gravel stages through the forests of Wales, two of which – Aberhirnant and Dyfnant – will be run in complete darkness. Wales Rally GB takes place from the 12th to the 15th of November. Until then, you can keep up-to-date with all the very latest CFR2Wales news by searching and following @CFR2Wales on Twitter, or by visiting the championship website (road-to-wales.carryduff.co.uk).